Summer Camps at Our PlayHouse encourage hands-on learning as children explore their interests in our indoor and outdoor classrooms. As children talk, hypothesize and problem solve with their peers, they gain a richer understanding of each topic. 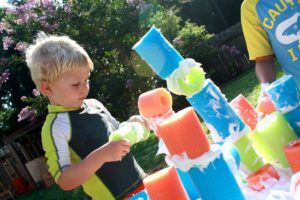 Topics include a curriculum based on daily sensory, art, building and movement activities, along with plenty of outdoor play! Each 2-week session of camp will focus on students’ interests within the topics of gardening, outdoor explorations, tinkering and art. During the sessions, teachers will work to provide materials and provocations to allow children to explore each topic in greater depth. Summer camps are for children age 2-6, with morning (8:30am-12:30 pm) and extended day (3:00pm) options. Flexible 2, 3, and 5 day schedules are available, depending on age. Incoming younger 2-year-olds must be registered for our fall program to attend summer camp. To register for summer camp, please complete the Durham Summer Camp Registration Form. After completing the online registration, families will receive an email confirmation and an invoice for total cost. Applications received in December and early January will be confirmed after winter break. Let’s go on an animal adventure! During this session of camp, children will be invited to go on a safari, explore the farm, work in a zoo, and go deep-sea diving to learn all about different kinds of creatures. Art, science, music, and dramatic play activities will help integrate our knowledge and learning. This session of camp is all about creativity! Children will have opportunities to tinker, create, and mess about with loose parts, art and building materials to create their own masterpieces and inventions. Science, art, and engineering will come together as we build, plan, compose, and create! Let’s climb the beanstalk with Jack, dream with Sleeping Beauty, build houses with the three little pigs, and walk the plank with Peter Pan! We will explore these and other stories and tall tales during the third session of summer camp. Children will have the chance to read classic stories and make up their own as we adventure into reading and storytelling. We will turn into mad scientists during the final session of summer camp! Children will have the chance to explore and discover all things icky, sticky, gooey, slimy, sizzling, and exploding as we experiment with physics, chemistry, and biology. Dramatic and gross motor play, as well as art and storytelling will be integrated into our science explorations. Discount Deadline March 1st: A 10% discount will be given to families who register and pay by March 1st. No refunds will be issued after May 31. Prior to May 31, you will receive a refund minus a $50 processing fee per week. Pending availability you may add to your schedule at any time. We cannot reserve your child’s space until full payment has been received. Summer Camp handbooks will be emailed prior to the start of camp. One week camp options are available to children who are signing up for the full 5 days. Families who desire a two or three day a week option must sign up for a minimum of two consecutive weeks. A one time $25 dollar enrollment fee will be charged to summer only families not currently enrolled at OPH.